When Using Bullets Mileage Calculator How Do I Account For The Return Trip In Bullets Mileage App? Q: When Using Bullets Mileage Calculator How Do I Account For The Return Trip In Bullets Mileage App? When I add a mileage expense it only gives the start and end points of a journey. How do I get the return part of the trip added to the expense? 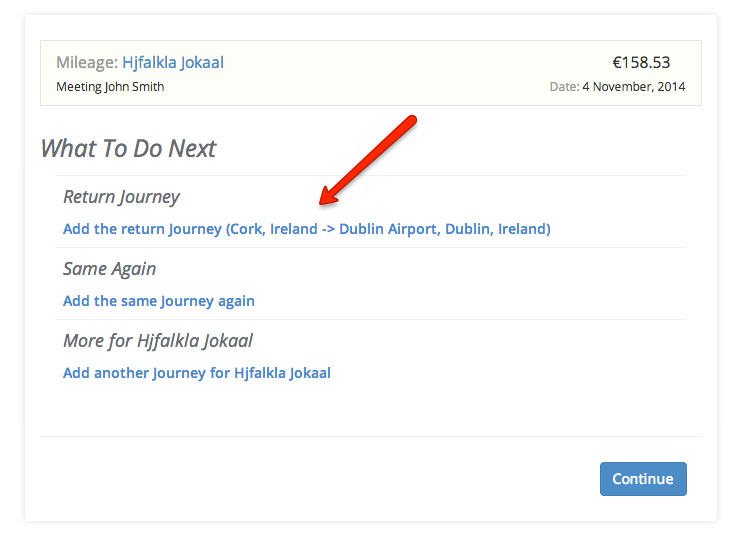 When you add the journey we automatically give you an option to add/modify the return journey. See here I created a Journey from Dublin to Cork and then Bullet suggests a return journey from Cork to Dublin. 85I need to up date the name on an old invoice how can I do this as the name as changed57What does software, domain names and hosting come under for accounting purposes?15Hi there, We’re a small yoga studio on Baggot Street. We get more than half of our payments through stripe now since we added it through our website (yogashala.ie). I was wondering if I might be able to integrate the payments we receive into Bullet without having to send an invoice first. Most of our students just go to our website to purchase a class-pass without ever being sent an invoice. At the moment I then have to create an invoice and mark it as paid. If I could integrate these payments automatically into Bullet it would definitely be worth the €10 a month for the add-on29Hi, I have a question re: taxes… Let’s say I received an invoice from a freelancer last October, but only paid him this month. He’s charged me VAT, does that VAT appear in the October period when I received the bill, or in the current period when I actually pay him? Bullet seems to put it in Octover, but I’d prefer if it could come out in this period, if that makes sense?93What happens when you send an email to a non-existent email address? ?